Lululemon’s no longer just somewhere to buy a state-of-the-art sports bra. The activewear giant recently launched its first healthy home line—and now it’s moving even deeper into wellness territory: Today, the brand opened its first-ever Mindfulosophy space. Sure, the name sounds a little Suessical, but it’s no fantasy. The destination’s designed to offer visitors a chill place for a mind-body reboot. Its main attraction? 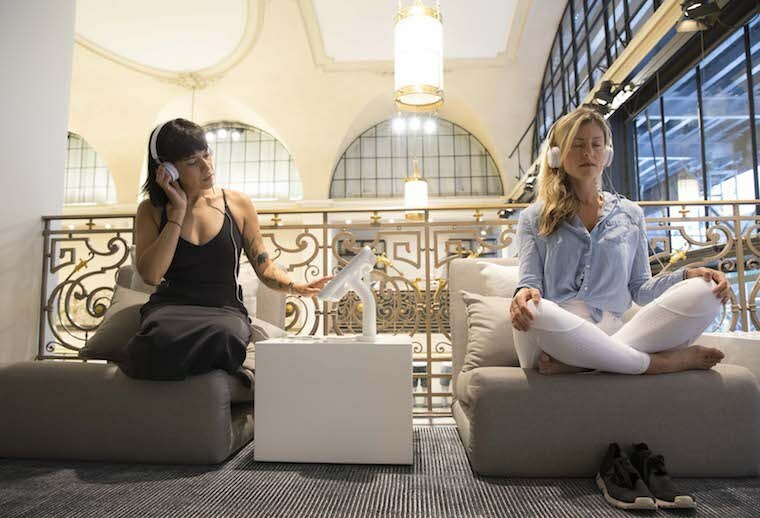 Zen pods—AKA super-comfy cushions where you can plop down, put on a pair of headphones, and listen to one of 12 different self-guided meditations recorded by Danielle Nagel, Lululemon’s director of mindful performance, and Tom Waller, the head of its Whitespace Innovation Lab. According to Celeste Burgoyne, Lululemon’s executive vice president of retail in the Americas, it’s a natural evolution of the fusion-retail model that began when the brand started programming in-store workouts. You’ll find the concept space inside a brand-new, 8,000-square-foot Lululemon opening at 597 Fifth Ave., across from Rockefeller Center, in New York City today. It’s one of two locations being added to the retailer’s growing roster—the other one is at 129 N. 6th St. in Williamsburg, an ultra-cool Brooklyn neighborhood. While the second store is podless, it’s still offering visitors an opportunity to unplug (and pick up Taryn Toomey’s capsule collection)—it’ll be hosting weekly summer yoga classes at the nearby William Vale Hotel. Perhaps it’s time to plan a namaste-cation. For some background reading on the fitness giant, check out Lululemon’s origin story. And here are some surprising facts about working for the brand.